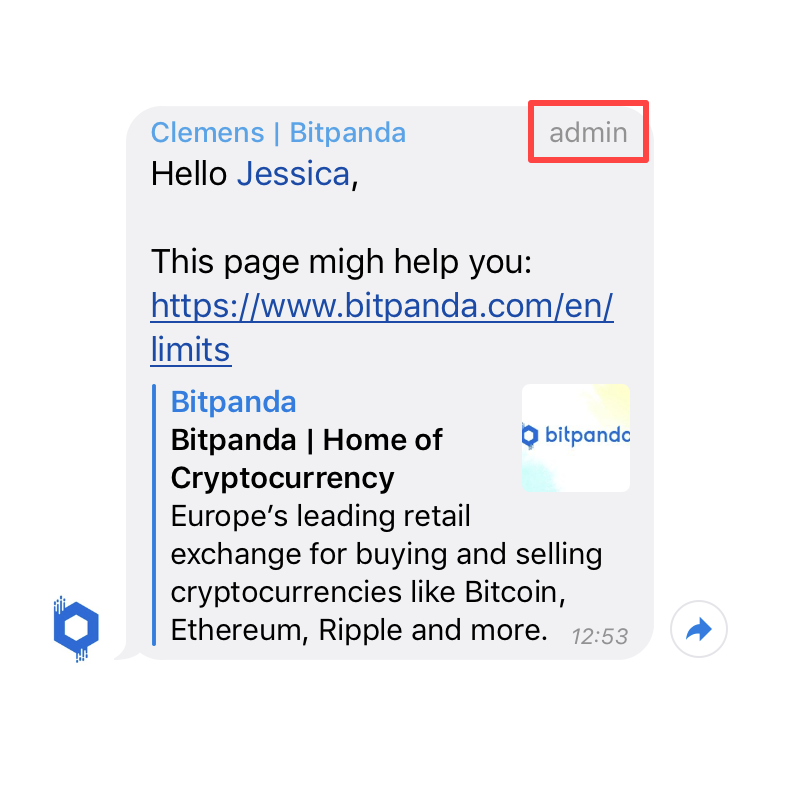 In the article How can I secure my Bitpanda account? we explain what you can do to make sure that your account stays as safe as it can be with measures such as two-factor authentication (2FA) and using strong passwords. In this article, we’re going to build on that and explain how you can protect your assets from external threats that you might encounter online such as scammers or malware. Impersonators of popular accounts (like ours) act like the real accounts on social media, they copy posts and generally try to convince unsuspecting users that they are the real account. Sometimes, they also try to contact people directly on the behalf of the company they are impersonating making unlikely offers like "send 1 ETH and get 5 ETH back." Unfortunately, lots of people fall for this scam and lose their coins to the scammer’s address. Normally (but not necessarily always), the offending account will post in the comments section or as a reply underneath a legitimate company post. It’s important to know that Bitpanda will never do a giveaway of this nature. These are the links to Bitpanda’s verified social media channels: Facebook, Twitter, Medium, Instagram and here is the link to our official Telegram groups. As a rule, you should generally exercise proper judgement on the web and don’t trust accounts with little content and followers that could be up to no good. On social media platforms such as Twitter, your @username or handle is entirely unique, meaning that only one account can have it at a time. Therefore, you can be sure that if an account is not @bitpanda — it’s definitely not us! This is a 100% safe method to verify that you’re dealing with us. 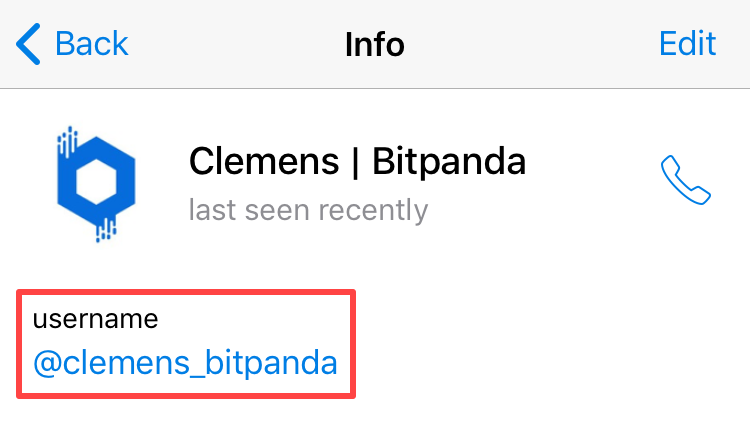 If you are going to make use of Bitpanda’s official Telegram groups then it’s important that you know who the real employees are. Legitimate organisations will NEVER ask for your important login credentials or sensitive data but there are those out there who will try. Also be alert for questionable downloads and don’t click on weird attachments or links in emails, this could well be malicious "mining" software that — at first — claims to do one thing but actually gains access to your device in the background. Once they have gained access, hackers could see what you are typing with keylogging software subsequently revealing passwords or codes. They could even potentially make screen grabs and see what you’re up to. Finally, just be sensible on the web. Make sure to stay up-to-date with the latests scams as scammers are constantly finding new ways to trick users, often going to great lengths to do so. Be cautious with every click and never disclose your sensitive data to anyone online. Read in full on our Medium Blog.